“De-fense, DE-fense.” The steady chanting of the Bears’ football fans cut through the cool autumn night. Moving into his defensive position, Billy glanced up at the scoreboard. He knew what it said -- zero to zero -- but he still liked to look, because the Bears were holding the Giants scoreless. They were stopping the best offense in the whole Middle School League. Billy tensed his legs. He was coiled and ready for the center’s snap to the Giants’ quarterback. When it came, he sprang into action. Jamming the guard in front of him,Billy extended both arms upward and popped the player just under his shoulder pads, bouncing off him as if he were a red-hot stove. “Get the quarterback. Sack the quarterback!” the Bears’ coach yelled from the sidelines. Billy spun past his blocker and looked in the backfield. The quarterback was already moving sideways, ready to turn the corner and race for the end zone. He had to be stopped. The Giants can’t score now, Billy told himself. Not when the game’s almost over. Not when it’s fourth down. Billy shuffled sideways like a crab, holding his shoulders square, forcing the runner outside. He knew if he let the quarterback get past him, he would need a motorcycle to catch up. Billy wasn’t fast, but he was big. He was strong. Keeping his eyes glued to the quarterback, he settled into his hitting position, watching the player’s belt buckle, ready for the fake. BAM! 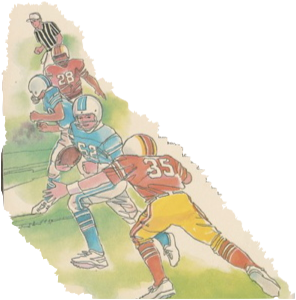 Billy hit the runner hard with his shoulder, using his legs to drive the quarterback upward and back. Two of his teammates joined in the tackle. Billy traded high fives with his best friend as they trotted off the field. Now it was the offense’s turn. If only they would score. If only the Bears could win. Bill couldn’t believe his team hadn’t won a game all season. They hadn’t even scored! It was embarrassing. "...and I’d be your running back,” Jackson said. “Fumble!” cried Billy, jumping to his feet. Watching for the snap, Billy smacked into the line where the center hiked the ball. Pushing, twisting, Billy plowed forward, trying to get through. The center and a guard shut him out. The Bears’ blitz wasn’t working. The Giants were trying a screen play, a short pass. Spinning to the side, Billy ricocheted off the blockers and leaped into the air. His hand slapped into the loose ball, shooting it straight up. He saw his chance. Cupping his hands together, Billy netter the tumbling ball with his fingers. Billy’s heart boomed in his chest. He had the ball. He could score. Springing down the field, Billy tucked the ball into his body. Giants were behind him; two on his left, one on his right. He could hear their feet pounding on the turf. He had to outrun them, but the goal line was so far away. Glancing to his left, Billy saw a Giant’s jersey closing in on him. He felt hands reaching out to grab him. Billy veered to the right, lengthening his stride, panting for breath. Billy gasped. It was Jackson, just behind him on his right! Jack could block the Giants. Jack could . . .
Billy loosened his grip on the football. He knew what to do. 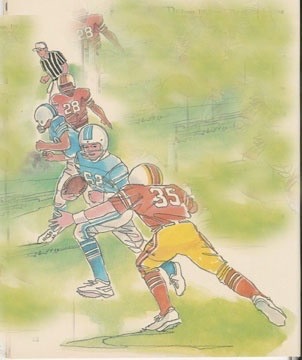 Tossing the ball laterally into his friend’s waiting hands, Billy crashed into the blue jersey on his left, knocking the the player off stide and giving Jack some running room. Jack galloped the final yards to the end zone, holding the ball up in a victory salute. Billy and the Bears went wild, jumping up and down, whooping for joy. They had scored! Billy scampered into the end zone, whirled his best friend around and pounded him on the back. "Give me five, Jack. Give me five," he said, repeating Jack’s favorite phrase. Billy laughed out loud, staring up at the scoreboard, watching it change the Bears’ zero to a six. “Yeah,” he said finally, grinning from ear to ear. “With a little help from my friends, wishes sure can come true."